Inocencia Perez is someone who is a connector within our community. When Inocencia learns about something beneficial, she makes sure that people in her network learn about the opportunity. She’ll also go one step farther and offer to babysit, if that is what is needed to allow a parent to make an appointment. TND and CONNECT are grateful that Inocencia found us, as she is responsible for bringing many of her peers in to access one of CONNECT’s many financial opportunity services and she has emerged as one of our community leaders. Like many in our community, three years ago Inocencia was facing displacement from her apartment due to rising rents. CONNECT helped Inocencia to stabilize her housing situation. She says that what keeps her involved, is her understanding that CONNECT can help her to achieve greater financial stability and mobility. In the fall of 2014, Inocencia was taking ESL classes at CONNECT. She initiated an effort to bring a group of Spanish-speaking students to a CONNECT Credit Class as she saw a real need for greater financial literacy among her peers. Always a good networker, Inocencia joined a CONNECT Family Circle, and then went on to host a series of Family Circles in her home. Through these facilitated gatherings, participants envision their financial dreams and they find support as they brainstorm and share their struggles. It was through another Circle participant that Inocencia found a job working in a restaurant, proving that she too could benefit economically as a result of her social network. Inocencia is one of the resident founders of Walk Wednesday, a joint project of MGH, TND and Social Capital Inc. 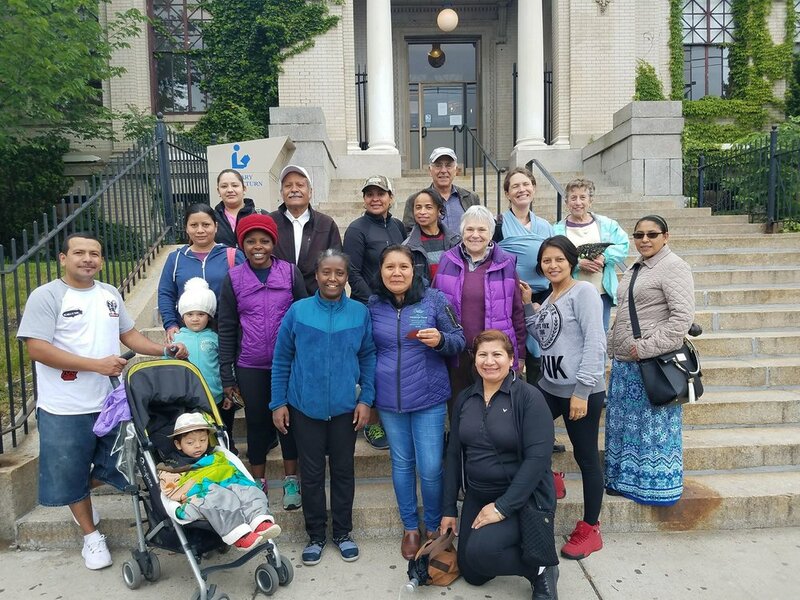 This group meets every Wednesday morning at the Chelsea Library to explore our city on foot, and to share information about beneficial community based services. Each week the group walks, stops for Zumba, and then visits a local business for coffee and treats. Due to Inocencia’s outreach and that of others, Walk Wednesday continues to grow with 30 participants this year.